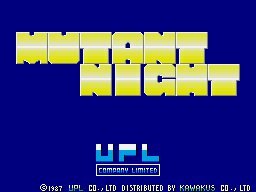 Mutant Night by UPL, arcade release in 1987. UPL. If you haven't heard of them, don't worry - almost no one has. Except for a couple of minor releases, they've flown fairly far beneath the radar. This is unfortunate, since they've released some pretty freakish games, which you probably could have guessed by the moniker of this one. Further, they also developed Atomic Robo-kid - have I proven my point yet? 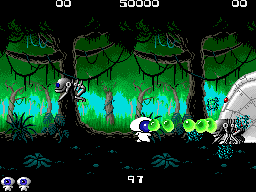 Mutant Night feels very much like it's (relatively) well-known brother, you control a bizarre little character capable of jumping and firing projectiles. Whereas the Robo-kid is a mechanical fella, Mutant Night's eyeball monster creature is decidedly more organic and acts accordingly. 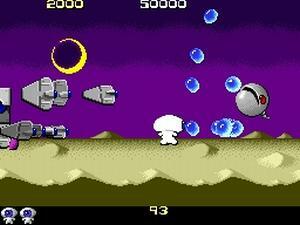 Still, like the Kid, he can (sort of) fly, though you need to keep slamming the jump button to maintain hangtime as opposed to the Kid's hover ability. This makes for some frustrating gameplay at times. 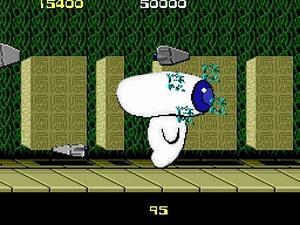 Your little eyeball can pick up a couple of helpful powerups - spread shot (awesome! ), duplicate bodies (somewhat helpful?? 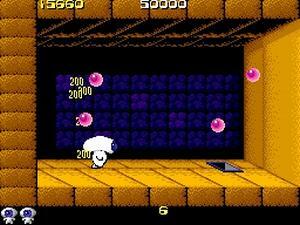 ), and of course once or twice in the game you can grow impressively HUGE and just smash your way through everything. This looks cool but never really shows up often enough to be useful. The whole game is a strange mishmash of elements, the developer's heart was in the right place and a lot of the pieces look pretty cool, but the execution is somewhat lopsided. 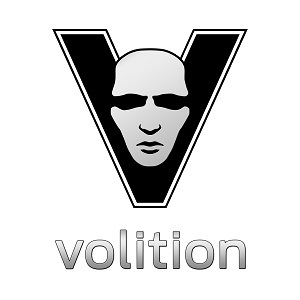 Still, I love out-there games and this one definitely fits the bill. Mutant Night is an acquired taste (like many UPL outings) but I recommend it if you like th' weirdness!